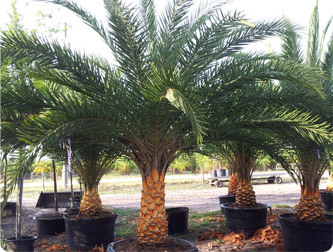 Majestic Tree Farm is proud to be the premier seller of the Phoenix Sylvester Palm in the Orlando / Central Florida area. Phoenix Sylvestris is also known as Wild Date Palm, Silver Date Palm or Sugar Date Palm. This tree is an attractive landscape specimen with its blue-green leaves, textured trunk, and yellow inflorescences. The canopy of this palm is dense, exhibits a round shape, and can provide light shade. This palm will thrive and show the best growth when it is planted in direct sunlight. It is drought tolerant and prefers well-drained sandy soils, but it grows better when regularly watered.